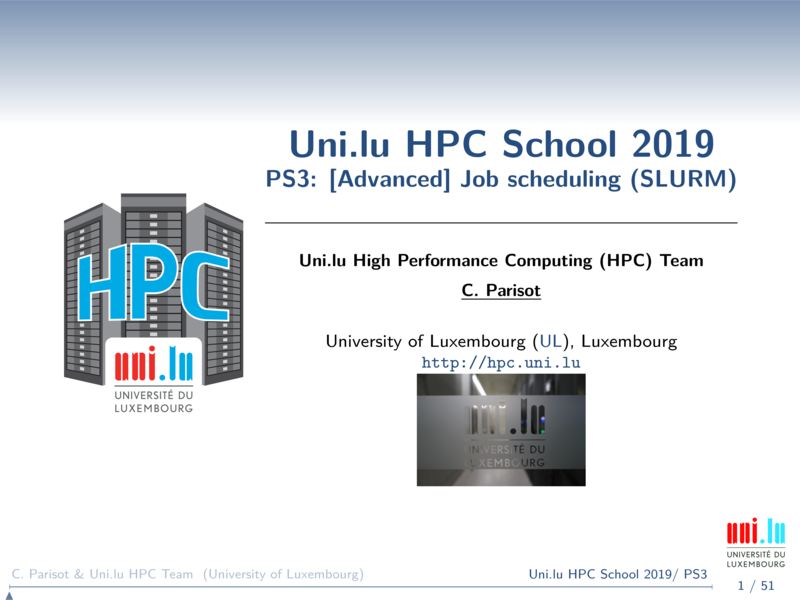 The objective of this tutorial is to practice using the SLURM cluster workload manager in use on the UL HPC iris cluster. You will now get familiar, if not already, with the main tools part of SLURM (otherwise skip down to Part two). You must first connect to the iris cluster frontend, e.g. with ssh yourlogin@access-iris.uni.lu -p 8022. All the commands used have detailed manuals (man $toolname) that you can always refer to. You can override it in your own ~/.bashrc with aliases that customizes it for your particular needs, e.g. Question: are all jobs visible by default? what does squeue -a do? Question: what other job states exist? Questions: What does the 'mix' state in the output of sinfo signify? What will happen to your jobs if the nodes are 'down' or 'drain'? What will you see when looking at a job with squeue or scontrol show job ? Question: now before exiting the job, what does env | grep SLURM give out? What is the walltime for this job? Question: can you ssh between the nodes part of this job? what happens if you try to ssh to a different node (not from your job/jobs)? if you are still connected to the job after 3 minutes, what happens? Note: as of 2017-11-09, direct X11 (--x11) support with srun (srun -p interactive --qos qos-interactive --pty --x11 bash -i) is being patched, and the below workaround is needed. exec ssh -X $headNode -t "$slurmEnv bash"
Question: what happens if you launch a graphical application (e.g. xterm)? did it appear on your own machine? if not, what went wrong? Question: can you make this job be preempted? try to allocate other nodes in the interactive partition and see what happens when the besteffort job is marked for preemption. Question: what partition is this job running in? how many cores and walltime did it reserve? Now start a job with one of the previous commands, and you will check its details (runtime metrics, status, after execution statistics, etc.). Question: what happens if you try to take a look at a job which is not in the queue (waiting/running) anymore (e.g. scontrol show job 2)? Question: remember that job id #2? can we see its information with sacct -j 2 --format=user and sacct -j 2 -l ? consumed energy (in Joules), be aware there are many caveats! Question: what do you see as "Reason" in squeue output on a large (say, 10 nodes interactive) job that you submitted and then ran scontrol hold $jobid on? Question: what happens when you try to suspend an interactive job? Question: what happens when you cancel a running job, does it get killed immediately? Question: what happens if you start two jobs with the same name and cancel by name? Question: what message do you get when you try to requeue an interactive job? We have made available a set of template batch launcher scripts for SLURM. how did your fair-share and usage values change? what efficiency values are shown by seff for the job?